A United Nations nutrition report released today shows that progress has been made in recent years in addressing stunting in children, and calls for increased efforts to accelerate a response to a condition that affects some 165 million children across the world. One in four of all children less than five years of age is stunted because of chronic under-nutrition in crucial periods of growth. The damage done to a child’s body and brain by stunting is irreversible. It drags down performance at school and later at work, and puts children at a higher risk of dying from infectious diseases. The UNICEF report, ‘Improving Child Nutrition: The achievable imperative for global progress’ notes that a key to success against stunting is focusing attention on pregnancy and the first two years of a child’s life. An estimated 80 per cent of the world’s stunted children live in just 14 countries. The report highlights successes in scaling up nutrition and improving policies in 11 countries: Ethiopia, Haiti, India, Nepal, Peru, Rwanda, the Democratic Republic of the Congo, Sri Lanka, Kyrgyzstan, the United Republic of Tanzania and Viet Nam. Stunting is reduced through a series of simple and proven steps such as improving women’s nutrition, early and exclusive breastfeeding, providing additional vitamins and minerals as well as appropriate food – especially in pregnancy and the first two years of a child’s life. In the Maharashtra state in India, the percentage of stunted children dropped from 39 per cent in 2005 to 23 per cent in 2012 largely because of support to frontline workers who focus on improving child nutrition. In Peru, stunting fell by a third between 2006 and 2011 following an initiative that lobbied political candidates to sign a commitment to reduce stunting in children under five by five per cent over the span of five years and to lessen inequities between urban and rural areas. Ethiopia cut stunting from 57 per cent to 44 per cent between 2000 and 2011 by implementing a national nutrition programme, providing a safety net in the poorest areas and boosting nutrition assistance through communities. The report says that existing solutions and the work of new partnerships represent an unprecedented opportunity to address child under-nutrition through countries accelerating progress through national projects coordinated with donor support and measurable targets. 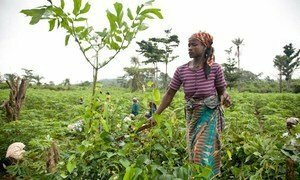 Governments must adopt food security strategies that empower women as this is an effective way to reduce hunger and malnutrition, a United Nations expert said today.